I warmly welcome all of you to this reception for the Icebreaker Awards 2013. 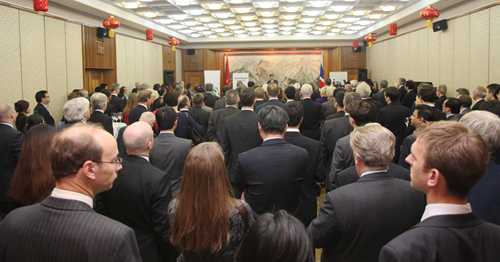 This event is co-organized by the 48 Group Club and the Chinese Embassy. First and foremost, I wish to offer my warmest congratulations to those who are going to receive the Fellowships and Honorary Memberships awards. The Icebreaker Annual Award Reception has become a strong tradition and signature event of the 48 Group Club. The annual reception tonight has a special meaning. This year marks the 60th anniversary of the pioneering ‘ice breaking’ journey from UK to China. Six decades ago a group of British business leaders visited China and opened the door of commercial relations between the UK and the new China. These businessmen had to overcome enormous difficulties and hostility about their visit in the UK and the Western world. 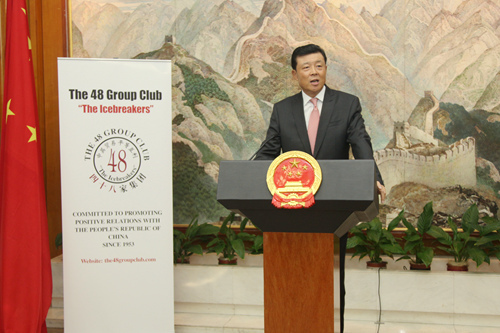 Last July, the 48 Group Club held a grand celebration in the Great Hall of the People in Beijing. I had the honour of being one of the witnesses to this event. What happened 60 years ago was an ‘ice breaking’ mission. There are some recent parallels. Not long ago, Chancellor Osborne led a delegation to China and co-chaired the fifth China-UK Economic and Financial Dialogue with Chinese Vice Premier Mr. Ma Kai. Some British media called his China visit ‘an ice melting trip’. The two sides have agreed to work together to promote a forward-looking, mutually beneficial and growth-oriented China-UK economic and financial relationship. I cannot help thinking about the lessons that can be drawn from the ‘ice breaking’ mission 60 years ago and the recent ‘ice melting’ trip! What can we learn? I believe there are at least three points for us to learn. First, between China and Britain, there will always be some ‘ice’ for us to face and overcome. This is because our two countries differ in history, culture, ideology, social system and development stage. We will always have different views on some issues. But what matters most is we should not allow these differences to stand in the way of our bilateral relations. Rather, we should proactively address and manage them. Second, after six decades of development, the ice in China-UK relations is becoming thinner, not thicker. This is why six decades ago, we needed to ‘break’ the ice. Six decades later, we need only to ‘melt’ the ice. In today’s China-UK relations, positive elements have become the mainstream. Cooperation is a compelling consensus. Third, the key to breaking and melting ice between China and Britain is that both sides are committed to the spirit of mutual respect, equality and mutual benefit. We both give top priority to the common interests of the two countries. This was what enabled us to break the ice 60 years ago. It is even more so today. Looking ahead, we should seize the new opportunities in bilateral relations, work in the ‘icebreaker’ spirit and act with ‘ice melting’ wisdom. We should aim to reduce obstacles and build up positive energy in our relations. I hope the 48 Group Club will attract more visionary members in the future as it has done in the past six decades. 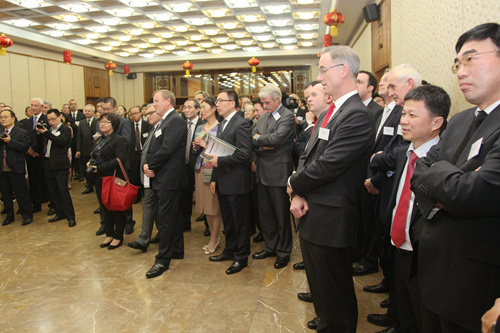 I hope these new members will carry on the ‘Icebreaker’ spirit and dedicate themselves to China-UK friendship. And finally, I hope more people will earn the honor of ‘Icebreaker Awards’ and join hands with us to advance China-UK relations.